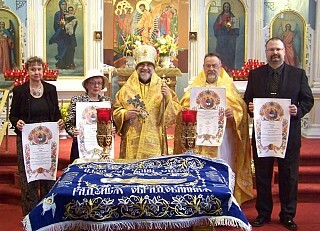 On the weekend of 11-12 October 2014, Saint Nicholas Orthodox Church in Cohoes NY celebrated their Centennial year. Saturday morning a memorial Divine Liturgy was celebrated commemorating departed priests, parish leaders, and parishioners who had served in the church the previous 100 years. That afternoon, Father Terenti Wasielewski (parish rector) offered a history session, speaking about Lemkovyna: the place of origin for many parish founders. Stephanie Stroyen provided a pictorial time-line of the parish history. Vespers was served and a fellowship followed. On Sunday, Bishop Michael celebrated the Hierarchical Divine Liturgy and the festive rejoicing continued afterward at the Ukrainian Citizen's Club of Cohoes. DIOCESAN ASSEMBLY: Videos, reports, and more now available!